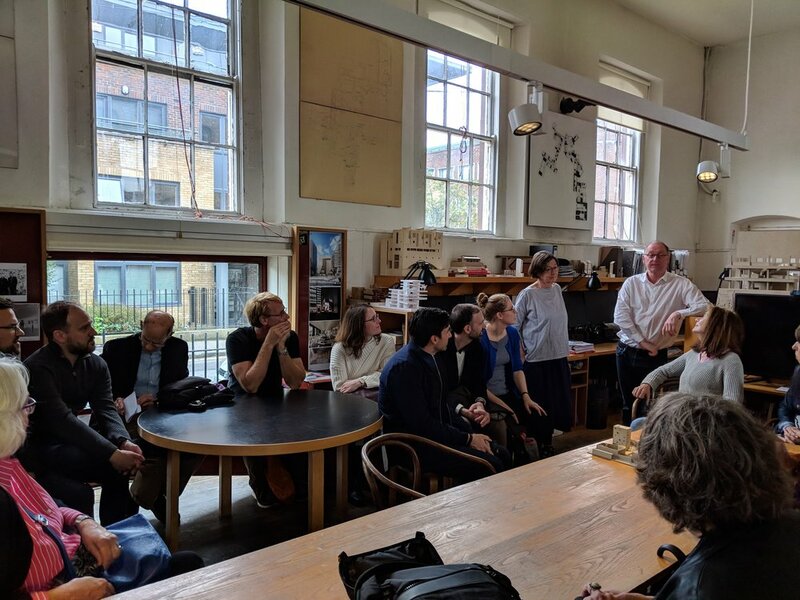 This year’s AIA UK City Excursion ventured farther afield than mainland UK, and ventured across the Irish Sea to Dublin, the capital city of the Republic of Ireland. The two-day weekend was jampacked full of a range of speakers and buildings, entitling attendees to a total of 12 Learning Units (7 HSW credits). We are very thankful to our sponsors TECHRETE for making this excursion possible with their generous contribution. Royal Institute of Irish Architects (RIAI) - The weekend started in the beautiful Georgian headquarters of the RIAI. Surrounded by the RIAI 2018 awards exhibition, the group gathered for a warm welcome by Kathryn Meghen, RIAI CEO. She told us of the work that RIAI does for Irish architects and explained some of its current goals. The RIAI is focusing on educating members on business skills, lobbying the government and providing CPD for its members. The RIAI has 3,600 members and holds roles as both a professional organization and licensing registration board - so for example both the AIA and NCARB combined, or RIBA and ARB combined. She noted RIAI’s pride that Grafton Architects curated the 2018 Venice Biennale, entitled ‘Freespace’. It was a great honor both for this talented firm and for Irish Architecture. To our delight, Meghen, generously provided the group with complimentary copies of the RIAI’s annual awards publications. Ali Grehan - Dublin City Architect - Next, the Dublin City Architect, Ali Grehan, spoke about the history of Dublin and some of the challenges that the city faces today. Dublin is 1,000 years old and in the 1700s was the second largest city in the British Empire. Dublin accounts for 55% of Irelands’ total GDP compared to London’s 23% of the UK’s total GDP. Almost overnight Dublin has become a multi-cultural city - something which has fortunately happened with little rancor. Building affordable housing; improving disadvantaged schools; increasing sustainability; and decreasing the use of cars via pedestrian zones continue to be key challenges for Dublin. PIVOT Dublin and AIA Centre for Communities by Design - Ali Grehan is also the founder of PIVOT Dublin which is an initiative driven by the need for better design in cities. She described Dublin’s Framework pilot project that has been inspired by a successful initiative run by the American Institute of Architects (AIA) called the Design Assistance Team (DAT), managed by the AIA’s Centre for Communities by Design in Washington DC. Framework introduced the Design Assistance programme to test how it could work within the Irish context. The pilot is a collaboration between Dublin Council City Architects Division and the AIA, which is guiding the process. Ali challenged AIA UK to start other collaborations with this group. If anyone is interested in starting this initiative in London please get in touch! Shane de Blacam - We left the RIAI to walk to Trinity College to meet Shane de Blacam, Partner at de Blacam and Meagher Architects, which was established in 1976. Shane received his Masters Degree from the University of Pennsylvania in 1970 and went on to work for Louis Kahn on the Yale Center for British Art. Shane talked about the history of Trinity College and then on his work on the restoration and addition to its historic dining hall, which is at the heart of Trinity’s social life, and on the new build Samuel Beckett Theatre. We then walked to Shane’s Wooden Building residential scheme on the edge of Temple Bar. Kahn’s influence is evident in Shane’s work; through it’s beautiful craftmanship, detailing and timelessness. Shane highly praised the American University education system - positive feedback which was lovely to hear from such a legend of Irish Architecture. O’Donnell + Tuomey – Studio Visit and the Sean O’Casey Community Centre - Sheila O’Donnell, FAIA, and John Tuomey, FAIA, founding partners of O’Donnell + Tuomey generously invited us to visit their studio. John and Sheila discussed current and past projects and gave insight into their design process and collaboration. ODT currently have two significant projects in London – the Victorian & Albert and the Sadler Wells outposts - which they are designing as part of East Bank in Stratford under the Allies and Morrison master plan. After the studio visit, we took the bus north across the River Liffey to the Sean O’Casey Community Centre in East Wall near the Docklands area. The building provides community resources, including a senior center, childcare and recreational facilities, a theatre and meeting rooms. The concrete tower element with its circular windows provides a strong identity for the building - which Sheila and John noted has become a key landmark for the community. The internal landscaped courtyard provides a tranquil and calm oasis. It is both a beautiful and functional feature of the building, often used by the children as an outdoor play area. A local resident worked with the landscape architects to ensure that appropriate plants were selected. The building has received numerous rewards and was shortlisted for the Royal Institute of British Architects’ (RIBA) prestigious Lubetkin Prize for architecture in 2009. However, its biggest success is how the community has embraced this building as its own and it is obvious that it will flourish for many years to come. Mairtin D’Alton – RIAI Docklands Walking Tour - Star RIAI tour guide Mairtin D'Alton led us on an informative and entertaining 90 minute walking tour of the Docklands. We saw many of the area’s highlights including the Samuel Beckett Bridge by Santiago Calatrava and the Docklands Convention Centre by Roche-Dinkeloo Architects at Spencer Dock. We looked at developments from the 1990s to the early 2000s. We walked across the East Link into Ringsend and finished in the Grand Canal Basin, stopping in front of the Liebeskind Theatre with public landscape design by Martha Schwartz. This termination point was also near the Charlotte Quay restaurant where we all enjoyed a fabulous dinner on Saturday night. Aviva Stadium – Scott Tallon Walker Architects - After our 20,000-step day on Saturday, on Sunday morning we had a little respite from walking, as we boarded our coach for the day and headed towards the Aviva Stadium by Scott Tallon Walker Architects and Populous. The stadium replaced the old beloved Lansdowne Road stadium, the oldest international rugby venue in the world. The project began in 2005 and - after a lengthy approval process - was granted planning permission in 2007 and was completed in 2010. Rebecca Ryan and Raeffala Roncoroni from STW along with two other members of the Aviva stadium staff led the group around an extensive building tour. We saw everything in the building from BOH access routes, to the rugby team changing rooms, to the special VIP boxes and of course we were allowed entry onto the beloved, sacred pitch. We appreciated the tremendous effort that the team put into this complicated project - from nestling the stadium into its residential surroundings to providing additional access. We were surprised just how much we liked the project with its attention to detail, the quality of construction and the fantastic atmosphere. Bucholz McEvoy Architects - After our visit to the Aviva Stadium, we ventured south of Dublin to see two gem buildings by Bucholz McEvoy Architects. Partner, Karen McEvoy, MRIAI, AIA, AKB, presented two projects - the Ballyogan Operations Offices and the Samuel Beckett Civic Campus. This small practice has made a big impact with their dedication to sustainable buildings in beautifully detailed packages and their work has been recognised with numerous awards. The two-storey timber framed Ballyogan Operations and Maintenance Depot is a low energy, naturally ventilated building that maximises passive energy sources and daylight. The architects designed everything within the building and used natural materials throughout. The building is situated on the site of the former waste dump for Dublin County that will become a park in future. We all wanted to work there! Next, we saw phase 1 of the Samuel Beckett Civic campus, which provides community facilities, a gym and classrooms for public use. The architects designed a master plan for the community, which maximizes the use of green space for playfields, transforming a previously neglected space. Kavanagh Tuite – GPO Witness History and Visitor Centre - In conceiving the programme of the two-day weekend excursion, I thought it was important for people to have a sense of the history of Dublin. So, the next stop was to the General Post Office Witness History and Visitor Centre, which was the site of the 1916 Rising which eventually led to Ireland gaining its independence from the British Empire and sent shockwaves through its colonies. The building opened on the centenary in 2016. Partner Brian Kavanagh and Associate Fergal Ryan spoke of the importance and context of the building in Irish history and detailed process of the restoration of the building’s brickwork. The new build portions of the project are sympathetically inserted into the courtyard. After the presentation our group was able to walk around the Witness History exhibition, which occupies most of the basement level. Heneghan Peng – National Gallery of Ireland - Last but not least, we visited the National Gallery of Ireland that has been recently refurbished by Heneghan Peng Architects. Partner Roisin Heneghan and Associate Director, Katarzyna Turza-Rachwal gave the group a detailed tour of the building. Their work entailed what they called ‘very detailed acupuncture-like work’ within the existing building fabric to provide environmental and lighting upgrades. Part of a two-phase master plan, the results are stunning. Externally, the project has achieved a more friendly and open face to the public and, internally, has led to the discovery of previously hidden spaces that enrich the visitor’s experience. Next year please join us for our weekend excursion to Newcastle 2019. Also, based on the success of the Dublin trip the AIA UK and AIA Continental Europe Chapters will be co-organising a City Excursion to Cork in 2020.